Facebook users are more trusting, have more close relationships and are more socially involved with others compared to the average American, according to a new survey from the Pew Research Center. Pew surveyed 2,255 people over the age of 18 (PDF link), and, adjusting for demographic factors, found that Internet users on the whole are more than twice as likely as non-Internet users to feel most people can be trusted, which is perhaps surprising considering how cynical the Internet makes us. However, frequent Facebook users are 43 percent more likely than even this to trust others. Pew says its survey indicates an average American has two "discussion confidants" -- people to whom we feel we can talk about the important things in their lives. A regular Facebook user betters this by having 9 percent closer core ties. Unsurprisingly, Facebook users also get more social support. According to the survey, Americans who aren't online rated the total support they receive from others as 75 out of 100. Facebook users rate their total support as 83 out of 100, leading Pew to suggest that "the additional boost is equivalent to about half the total support that the average American receives as a result of being married or cohabitating with a partner." In other words, Facebook is great if you're single. And if you're thinking of hooking up with old school friends, you'll be pleased to hear that Pew found the largest share of Facebook friends -- 22 percent -- are old high school pals, while nine percent are old college friends. The average Facebook user has 229 friends and 7 percent of these are people the individual has never met. 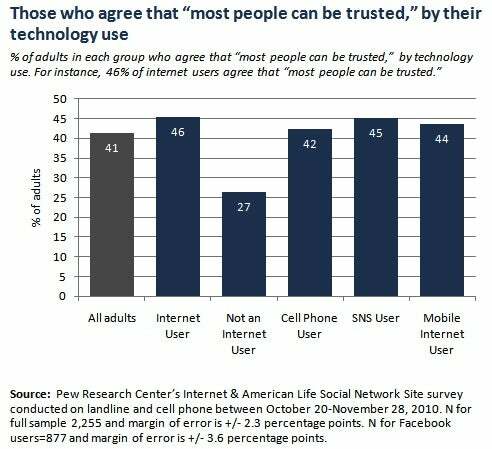 Perhaps surprisingly, Pew found that only 40 percent of users friend every one of their closest confidants on Facebook. This is better than the last survey in 2008, where just 29 percent did so, but the low number might relate to the age-bias within Facebook membership that discounts older family members. Pew's figures indicate that while those over 35 are taking up a growing share of Facebook users compared to 2008. The good news for the dwindling number of MySpace users is that they're more likely to consider multiple points of view compared to other Internet users.